Publisher Wizards of the Coast. Released August 2005. Format Hardcover. Game system Dungeons & Dragons. Setting Eberron. Pages 160. Price $29.95. Designers David Noonan, Rich Burlew, Frank Brunner. Cover artist Wayne Reynolds. Sometimes a book is released that helps define a setting. When your read it you go “ah, now I understand!”. Explorer’s Handbook for D&D is one of those books. I like Eberron, I like the sources for inspiration and I like the rules system. Still it has been difficult for me to know what I was supposed to do with it all. When playing, it felt more like just ordinary D&D, without the spices that supposedly makes Eberron special. This uncertainty was laid to rest with this book. Explorer’s Handbook’s focus is exploration, how to do it and where to do it. Leave Sharn and discover the world, board the ligtning train and leave the civilised countries behind; the Eberron atmosphere is taking shape, and it feels like Raiders of the Lost Ark! Only with swords and sorcery, of course. First out is a discussion about why and how you travel and how long it takes. After that comes equipment, organisations, expeditions and prestige classes. You also find maps showing several different vehicles, like airships, storm ships and lightning rail trains. The PCs kan be members of the organisations described and adventure hooks for this are detailed as well. This is followed by sections on places where the PCs journey can start, stops on the way and final destinations. You are given examples you can use straight out of the book, maps, NPCs and adventure hooks. To spice things up the writers also include short comments on specific details of the Eberron setting. The contents of this book is aimed at the Dungeon Master. The style of writing shows more attitude than the more standard D&D fare, which I find somewhat boring in the generic books. Sometimes this feels awkward but most of the times it works well and makes reading the text an enjoyment. 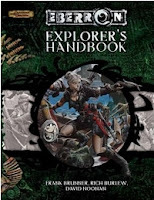 Most of the contents in the Explorer’s Handbook is specific for Eberron but since the places described are unknown to most people on Eberron, including the PCs, they can easily be transferred to another campaign setting. If you are a Dungeon Master who is thinking about what to do with Eberron will get lots of ideas and examples of how to create new adventures with that pulp feeling Eberron has as a signature trait from this book.